1.3 megapixels HD CMOS sensor. Default adopt 8mm megapixel HD fixed lens, compatible with range 3.6-25MM fixed lens. 4 PCS IR-III Dot Infrared Lights.Indoor IR distance can reach up to 60-80M. Built-in Wifi, with wireless AP function,Extensible 4G dial-up to internet. With TF card slot, TF card can be preset, maximum support 128G. IE,CMS and intelligent mobile APP(Iphone IOS, Android system) for remoter monitoring, parameter setting and recording playback. Elegant metal shape with user-friendly design, beautiful appearance, easy to adjust and install. Adopting the newest 1.3 megapxiels SC1135 HD CMOS sensor which presented by SmartSens, Realize 960P HD real time Output, more powerful low illumination sensitivity, lower pixel noisy, higher color reproduction ablility and brightness. Embedded RTOS design, High-performance processor HI3518E DSP, hardware watchdog, H.264MP compression, real time compression by independent hardware, high quality image with low code flow, synchronour monitoring of the audio&video, support two-way voice intercom. Default adopt 8mm megapixel HD fixed lens with better night-view performance than normal lens, compatible with range 3.6-25MM fixed lens. 4 PCS IR-III Dot Infrared Lights.Indoor IR distance can reach up to 60-80M; Design with intelligent light-activated and automatically detecting technology to control the infrared lights, reducing working hours of the light and extending product life in an energy-saving and environment-friendly way. Adopting IR-CUT, more clear image, better color reproduction, lower illumination.it can up to 0 Lux when the IR on. 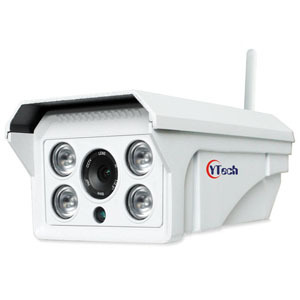 Use IR trigger control the signal, IR color cange to B/W sybchrobously, IR-CUT and IR switch auto-sync, lower noise at night. Built-in Wifi, with wireless AP function, in the absence of network environment can also be provided by AP hot spots connected to the camera for monitoring, setting and playback operations. Extensible 4G dial-up to internet, not limited by network and wiring, it is suitable for monitoring the environment of ponds, orchards, roads, parks, forests, grasslands, deserts, etc. Elegant metal shape with user-friendly design, beautiful appearance, easy to install, IP66 waterproof and dust-proof grade, fully adapt to various indoor and outdoor scenes. One channel 10/100M adaptive RJ45 interface, Use DC 12V power supply, POE is optional. Adopting Embedded LINUX system, more stable operation, higher security perfomance. Can be connected with HVR, NVR and CMS, the video can be stored in different computer to ensure the safety of the data. With dual stream, Auto adjustment can be realized at 0.4Mbps-2.0Mbps code and 1-30 f/s, Support 3 network transmission methods of self-adaption, iamge quality priority, fluency priority, powerful network data transmission and remote operation ability. Built-in web sever, the remote real time operation such as recording, preview, video search, playback, parameter configuration can be realized by IE or CMS system, and support client (maximum up to 30)remote view simultaneously. TF cards is optional, Maximum support 128G TF cards to local storage of video and snapshot files (client computers can download files on TF cards through the network for backup). Support IE,CMS and intelligent mobile APP(Iphone IOS, Android system) for remoter monitoring, parameter setting and recording playback. Adopting the newest 1.3 megapxiels SC1135 HD CMOS sensor which presented SmartSens, and the High-performance processor HI3518E DSP which purely compressed by hardware. IR-CUT switch consists of IR cut-off filter and all spectral through filter..When the IR cut-off filter on, it can block infrared wavelengths which affect the imaged badly at the light sufficient day time, above 95% 700nm infrared can be cut-off, then the CMOS Sensor can produce accurate color images, get more pure and softer picture, finally make consistent with human vision.At night, the IR cut-off filter will auto switch to spectral through filter while the light insufficient, then CMOS Sensor make full use of visible light to improve performance of low illumination, reduce the noise, clarify the image. 1.3 Megapixles resolution, it can provide brightness and colorful video, which can compatible with CCD effect.